Reducing the fat in your diet does not mean that you have to completely sacrifice having a sweet delicious oatmeal cookie. 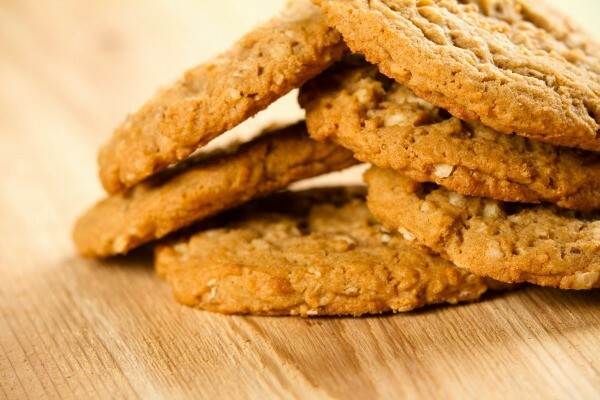 This page contains low-fat oatmeal cookie recipes. My mother gave me an economy sized container of quick cook oats. Does anyone have a low-fat recipe for oatmeal cookies? I am on Weight Watchers. Or any other creative ways of using the enormous container of oatmeal. It would take my family 6 months to eat it! Any suggestions will be greatly appreciated! Thanks so much. My mother follows the recipe on the oatmeal box only substitutes Splenda for the sugar. My dad likes them better, not as sweet and great for diabetics. Use oatmeal instead of bread or cracker crumbs in meatloaf, meatballs etc. You can also grind it finer in a blender or food processor and use like a specialty flour in baking oher than cookies. How about whipping up a batch or two of granola? it can be made low fat too. Leftover cooked oatmeal is great in pancakes. There are all sorts of different recipes using oatmeal at the Quaker web site. Not just cookies and that sort. They have on the link above where you can filter out just the cookie recipes that are heart smart or ones that are low cal etc. Preacher cookies use a lot of oameal but really aren't low cal by any means. They are almost like candy. Granola uses lots of oats and can be made to be low cal or low fat with the right recipe. I keep meaning to try it but have not yet is a recipe I keep seeing for Baked Oatmeal. Supposidly even the leftovers are good. For a different taste in breakfast oats, add a spoonful of peanut butter to the warm cereal. It is yummy. And you can put the uncooked oats into freezer bags and keep it a year or more. Mix all together and drop by spoonfuls on ungreased cookie sheet. Bake in 325* oven for 10 - 12 minutes. 1. Bake at 350 degrees, 30-35 minutes. Also can be cut in half and microwaved. Also, oatmeal is soothing for the skin. Good to use as a facial scrub, or a little in bathwater, or tied in a washcloth in the shower. I was looking for another recipe and came across this one for Oatmeal cookies on the WW forum. It has applesauce instead of fats and egg white instead of eggs. We make granola! Lots of recipes on the internet, though I use Tightwad Gazette's w/ the addition on coconut, and cheap nuts: sunflower seeds, pepitas(pumpkin seeds, shelled), and sesame seeds--all bought in bulk. Not exactly low-fat, but filling, and so much cheaper and healthier than processed dry cereal. I've also made scones, muffins, used it in meatloaf, but I find the cookies good, if a bit dry. But making a double-batch of granola can use about 10 cups at once, and it lasts for awhile. We like it on our homemade yogurt, too! I'm looking for a oatmeal cookie or bar recipe that is fat free and low in carbohydrates. I'm looking for recipes for low fat/low or no sugar oatmeal cookies. I just love these darned things, but they are so full of fat and sugar. 1. Substitute Splenda for 3/4 of the sugar. I always maintain at least 1/4 of the sugar amount as real sugar. 2. Substitute unsweetened applesauce for all of the margarine/butter. Don't use equal amounts though. Two tablespoons of applesauce is usually appropriate for a standard recipe. I do this for muffins all the time, and it works great. But be aware that using applesauce means that your cookies/muffins won't keep more than a couple of days unless you refrigerate them. That's usually not a problem at my house!